The Free Trade Area of the Americas (FTAA) is the expansion of the North American Free Trade Agreement (NAFTA) to every country in Central America, South America and the Caribbean, except Cuba. Negotiations started immediately after the completion of NAFTA in 1994 and are due to be completed by 2005. Negotiated behind closed doors, with little citizen input but plenty of suggestions from corporations, the FTAA is yet another example of the kind of free-market fundamentalism that has created a global race to the bottom that erodes environmental protection, workers' livelihoods, and human rights. If NAFTA has been a disaster for working families and the environment in the US, Canada, and Mexico, this will be far worse. 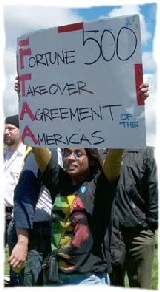 The Free Trade Area of the Americas (FTAA) is the formal name given to an expansion of NAFTA (the North American Free Trade Agreement) that would include all of the countries in the western hemisphere. This massive NAFTA expansion is currently being negotiated in secret by trade ministers from 34 nations in North, Central and South America and the Caribbean. The goal of the FTAA is to impose the failed neo-liberal NAFTA model of increased privatization and deregulation hemisphere-wide. Imposition of these rules would empower corporations to constrain governments from setting standards for public health and safety, to safeguard their workers and to ensure that corporations do not pollute the communities in which they operate. Effectively, these rules would handcuff governments’ public interest policymaking and enhance corporate control at the expense of citizens throughout the Americas. The FTAA will contain a series of commitments to 'liberalize' services, which is much like the General Agreement on Trade in Services (GATS) within the WTO. 'Services' is a broad category that includes education, health care, 'environmental services' (which can include access to water! ), energy, postal services and anything else we pay for that isn’t a physical object. If you can't drop it on your foot or stand on it, then it is a service. FTAA will include 'investor-to-state' law suits. These allow corporations to sue governments directly for the removal of standards or laws designed to protect public health and safety, which may cost the corporations a little more in operating costs. In other words, the FTAA would provide a hemispheric 'regulatory takings' clause that explicitly values corporate profit over human costs. Under the proposed FTAA investment rules, expropriation is also defined in broad terms to include not only direct but indirect forms of 'takings'. Foreign corporations can sue governments not only for 'physical takings', such as property or assets, but perhaps more importantly for 'regulatory takings', such as public interest laws on health and environmental concerns that may affect a company’s current or future profits. It does not matter what the purpose of the regulation is or its legality in domestic law, foreign corporations will have the right to sue governments and claim compensation for alleged 'regulatory takings' through the FTAA. Bolivia, is one of the poorest countries in Latin America. The giant US engineering corporation, Bechtel (which has massive contracts in post-war Iraq), is currently using the NAFTA-like provisions in a bilateral investment treaty to sue the Bolivian government for $25 million in future-lost profits. The suit was filed after a subsidiary of Bechtel lost control of its one million-dollar investment in the water services of Cochabamba, and was compelled to leave the city when the population rose up against the corporate take over of its water. The agricultural rules in these trade regimes have little to do with overcoming hunger, improving a country’s food security or enhancing the livelihoods of small farmers. On the contrary, these rules are meant to serve the interests of agribusiness. In the new global food system, agriculture, where farmers grow food to feed people and communities, has been replaced by a system of agribusiness, where transnational food corporations produce food for profit while food safety and the rights of family farmers go by the wayside. Since the WTO’s Agreement on Agriculture, which is to be incorporated in the FTAA, is largely designed to promote the production of crops for export, more valuable food producing land in Latin American countries will be used for export-oriented production rather than producing food to serve the needs of their own peoples. The US is trying to force all countries to accept biotechnology and genetically modified (GM) foods in which unregulated US-based corporations have taken a lead. Yet food security organizations all over the world agree that these technologies will increase hunger in poor nations. Several states and municipalities in the Americas - from Oregon to Mato Groso, Brazil - have passed anti-GM legislation. These statutes will no doubt come under heavy fire from corporations under the FTAA. Any expansion of Chapter 11 through the FTAA will further threaten local, state and national governments' ability to enact legislation to protect their citizens and environment. Consumers say they do not want GM foods, and if such foods are on the market they should be labelled, Big Business and Big Bad Government have conspired to shove unlabelled GM food down our throats. With the FTAA, labeling laws will be 'harmonized' to the low standards of the US - ie, no labels for GM foods. Introduction of GM crops to Central and South America, will accelerate GM contamination. Latin America is one of the most biologically and culturally diverse regions on the planet. Dozens of crops have been developed and domesticated by Indigenous peoples over the last 10,000 years, including maize and potatoes, two of the world's most important crops. Mexico alone is the center of origin and diversity for some 112 crops, including tomatoes, beans and peppers. The introduction of GM crops into these regions threatens the long-term viability of not only the crop itself, but the ecosystem as a whole. Additionally, 7 of the world's 12 mega-diverse countries, (Mexico, Brazil, Venezuela, Peru, Ecuador, Costa Rica and Colombia) are found in the Americas. Mega-diversity countries represent the majority of the world's biodiversity and surviving Indigenous peoples, the true guardians and developers of biodiversity. Being forced to buy expensive patented seeds every season, rather than saving and planting their own, will force traditional subsistence farmers in the developing world into dependency on transnational corporations and closer to the brink of starvation. If the US position wins out, FTAA will promote the interests of bio-tech and agribusiness giants like Archer Daniels Midland (ADM), Cargill and Monsanto over the interests of hungry people in developing nations. Archer Daniels Midland (ADM) and Cargill together control roughly two thirds of US corn and soy exports. These two corporations have benefited from the lion's share of US government agriculture subsidies, allowing them to consolidate and expand their market share throughout the continent. ADM, for example, owns 22% of Maseca, Mexico's largest corn meal producer, which is now invading South and Central America. In addition, both ADM and Cargill are involved in joint ventures with life science corporations, Novartis and Monsanto, respectively, further extending their monopolistic control. ADM and Cargill have generally refused to segregate GM from non-GM crops, eliminating consumer choice and imposing GM foods on consumers. The US is trying to expand NAFTA’s corporate protectionism rules on patents to the whole hemisphere. These rules give a company with a patent in one country the monopoly marketing rights to the item throughout the region. These rules are enforced with cash fines and criminal penalties, making these rules even harsher than the WTO Intellectual Property Rights rules. The quest to develop and patent biodiversity, especially medicinal plants and crops, is threatening our food security, access to health care and the biological and cultural diversity of the Americas. The FTAA Intellectual Property Rights chapter will require that member countries allow the patenting of life forms and the extension of US Life Science patents across the continent. Member countries will be unable to restrict or deny corporations' access to biological riches. These rules have been used as justification by pharmaceutical companies seeking to quash generic production of life-saving AIDS drugs, which makes the drugs cheaper and therefore more accessible to more people, as a violation of the company’s patent rights. This monopoly control allows pharmaceutical corporations to keep drug prices high and block production of generic versions of life-saving drugs, which spells disaster for the ill and impoverished, especially in developing nations. These rules will legitimize biopiracy, allowing companies to 'bioprospect' and file patents on traditional medicines that are considered traditional knowledge, effectively robbing indigenous people of their cultural heritage to fatten corporate wallets. GATS rules and related trade rules will be applied to a wide range of public services. Worse still, the FTAA’s service rules are designed to lock-in privatization. Once a government has decided to deregulate and privatize public services like health care, education, social assistance, water, electricity or postal services, it would be virtually impossible for another government to reverse the decision. The demands for compensation payments under the FTAA would be too prohibitive for most governments. People throughout the Americas are mobilizing to educate their communities about this coming 'free trade' regime. Groups around the hemisphere are working together on an alternative agreement that will offer a workable vision of what a fair trade agreement would look like. Hemispherically, people are organizing public referendums to ask whether or not their governments should participate in further FTAA negotiations. In September of 2002, 10 million people participated in the Brazilian consulta! For nearly two decades, Bolivia, like Argentina, has, followed the IMF neoliberal prescription to the letter. Public services have been cut, everything that can, has been privatized. Bolivia is now the poorest country in Latin America. With the country on its knees, its people impoverished, the World Bank demanded the privatization of the public water supply in Cochabamba. The local water company, Servicio del Agua Potable y Alcantarillado, was sold at a knock down price to International Water, a subsidiary of the US Bechtel. Water prices were hiked, the collection of rainwater made illegal. In a city where the minimum wage is less than $100 a month, the local people found they were paying as much for water as food. The people mobilised, La Coordinadora de Defense del Agua y de la Vida was formed. The city was shut down, martial law declared, and protesters shot and at least one killed. Bechtel employees were forced to flee the country. The government was forced to hand the water company back to the people. The Cochabamba Declaration calls for the protection of universal water rights. The reaction of Bechtel has been to sue the Bolivian government for lost profits.